Teaching kids the story of Holy Week is not easy, but it helps them more fully appreciate Easter. Photo courtesy of Kathy Schmucker. The story of Holy Week is not exactly family-friendly, but that doesn’t mean we can skip the part about Jesus’ journey to the cross when sharing our faith with our children. Adults should be mindful of how they tell children the difficult and sad story of Jesus’ death, but children are capable of processing it when shared appropriately. Taking pictures: “One way to engage children in looking at the cycle of life during Lent,” Gordon offers, “is through a camera lens by seeking out images that help us turn to God.” Picture Lent, a ministry of the Life Enrichment Center of the Florida Annual Conference, invites participants to post pictures to social media that relate to daily devotions on their blog. “This is an excellent way to use media as a positive tool,” Gordon says. Donating coats: Holy Week begins with a celebration. On Palm Sunday, Jesus’ followers cheer him as he enters Jerusalem, laying their cloaks on the ground for Jesus’ animal to walk on. Schmucker’s congregation uses this story as an opportunity to serve. In our homes, after telling our children about Palm Sunday, we can go with them to their closets to select coats and clothes they no longer need. Donate the clothes and teach your children how giving to others is a way of giving to Jesus (see Matthew 25:31-40). Holy Week services for children at First United Methodist Church in Fort Worth, Texas, are highly experiential. 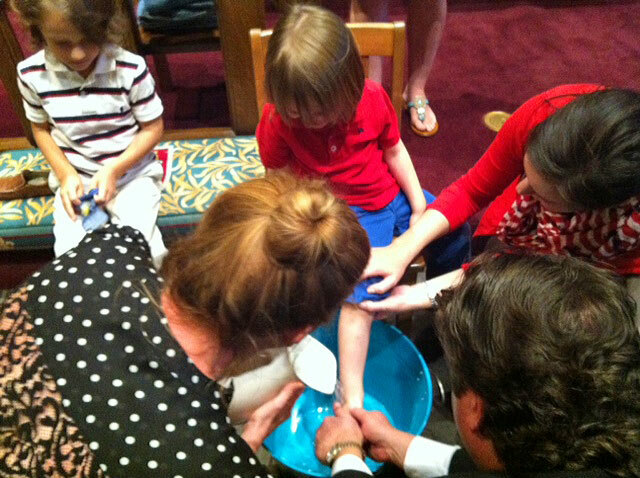 The Maundy Thursday service includes foot washing. Photo courtesy of Mark Burrows. Schmucker also designs tactile experiences. One year she witnessed a special moment at a prayer station reflecting on Jesus washing his disciples’ feet. “It was a beautiful, tender moment shared between father and son as they washed each other’s hands and prayed for each other,” she remembers. We can create similar moment in the home at bath time, while washing the dishes, or watching rain or snow fall. As the water makes everything clean, Jesus makes us clean and new through the forgiveness of our sins. A family meal: Dinner on Holy Thursday can also be a teaching moment. Share with your children how when Jesus gathered his disciples for that special meal, he told them he was excited to be with them before things got difficult (see Luke 22:15). Tell your children how much you enjoy eating dinner together. Remind them that they can come to you when things are hard, and that you and Jesus will always be there for them. Teaching children about sadness and prayer can be an important part of what is learned during Holy Week. Photo courtesy of Kathy Schmucker. Acknowledge sadness: Sharing the painful and sad story of Good Friday with your children can be challenging. It is a good time to remind children that sometimes we feel sad, and that is OK. God is with us even in our sadness. Legos and butterflies: One year, Schmucker taught children about grief by telling them about the Wailing Wall in Jerusalem. She shared people’s sadness at the destruction of the Temple, an image Jesus used to talk about his death (John 2:18-22). She also told them that people today write prayers and place them in the crevices in the wall. The children then helped help her build a prayer wall out of Legos. When it was complete, they put their prayers in the wall. Later they “took the prayers from the Wailing Wall and folded them into butterflies,” Schmucker explains. “The butterfly prayers were then strung across the ceiling of the worship space for Easter morning” as a symbol of resurrection and new life. We can set aside places in our homes for our families to write their prayers on scraps of colored paper each day during Holy Week. Then on Easter Sunday, the family can work together to make a colorful butterfly collage with the prayers. After sharing the difficult story of Holy Week, your children will be ready to celebrate Easter with a new understanding. This feature was originally published on March 3, 2016. *Joe Iovino works for UMC.org at United Methodist Communications. Contact him by email or at 615-312-3733.